In ENL's treatment of the optimization of output quantities it is assumed that value and cost remain unchanged. In graphical terms, this means that the value and cost curves are fixed. However, the health results of an economy can be significantly enhanced by modifying the underlying value and cost conditions, which would be reflected graphically by shifting and rotating the curves. Potential value will rise if improvements are made to food nutrition, toy safety, and output durability. Effectual value will increase with lower output spoilage and lower maldistribution. Labor cost will decrease if excessive stress and fatigue are avoided in the workplace, and if worker injuries, diseases, and deaths are reduced. Natural cost will decrease if the rate of toxins released from production processes goes down. Of course, decreasing either labor cost or natural cost will decrease input cost. The various improvements in cost and value are depicted in the following figure, which can pertain to either a single output or an economy's total outputs. Health can be increased by changing the output quantity while leaving the value and cost curves unchanged. Another approach, available over the long run, is to shift the curves themselves by increasing output quality, decreasing natural cost and labor cost, and so forth. ￼￼￼￼￼￼￼￼For the economy as a whole the beneficial changes can be applied to one or more outputs of the current output mix, but it is also possible to alter the mix itself. Existing outputs can be dropped and new outputs can be added. Aggregate effectual value, for example, will increase if an output that result in negative effectual value is no longer produced. Aggregate input cost will decrease if an output with a sufficiently negative input cost is added to the output mix. However, it should be clear that the addition of an output with above-average potential value does not necessarily increase aggregate health. The effectual value for such an output could be below average, thereby causing overall health to decrease instead. Potential value, because it is only a capacity, is exceptional in this regard. 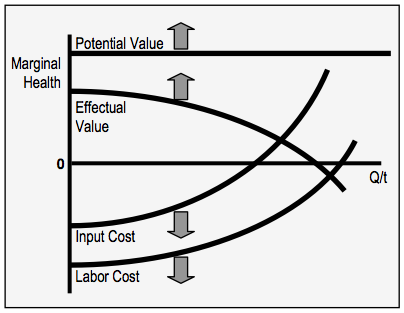 The addition of outputs with above-average effectual value, or below-average labor cost and natural cost, will unconditionally increase aggregate health. One of the key effects of shifting the value and cost curves is that the optimum output quantity will likely change as well. An example is shown in the following figure, which can again pertain to either a single output or to an economy's total outputs. When economic conditions are improved by increasing effectual value or decreasing input cost, the optimum quantity increases, thereby generating unrealized gains. To reach the new optimum, output quantity must increase. If effectual value rises or input cost declines, the output's optimum quantity will increase. Using the example of bread, we can imagine input cost decreasing due to better working conditions in our bakeries. This could be due to a change in technological intensity associated with a change in labor productivity. A lower input cost could mean that marginal input cost will not equal marginal effectual value until we reach 12,000 loaves, which would be the new, higher optimum quantity for bread. In general, any outward movement of the curves will expand the prospective gains area and increase the optimum output quantity. Conversely, any inward movement of the curves will contract the prospective gains area and decrease the optimum output quantity. In the preceding figure, the light-colored area at left represents the initial gains. When the effectual value curve shifts up from EV1 to EV2 and the input cost curve shifts down from IC1 to IC2, additional gains will be achieved even if the output quantity remains stable. However, the optimum output quantity will shift to the right, resulting in the unrealized gains indicated by the dark-colored area at right. 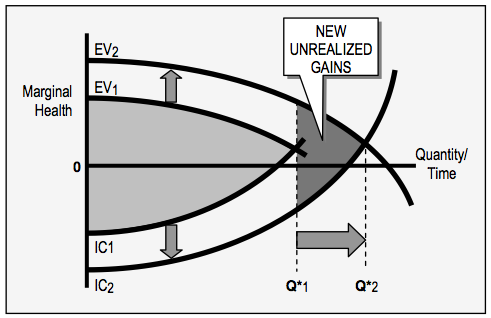 To capture these newly available gains, output quantity must increase from the original optimum Q*1 to the new optimum Q*2. It may seem odd that our society will rationally consume more bread because of improved working conditions in our bakeries. However, this is the logical result of treating everyone in our society as economic equals, meaning that a gain for one is a gain for all, and a loss for one is a loss for all. If labor conditions improve in our bakeries, we as a society will be able to produce more loaves before our overall losses exceed our overall gains. The fact that the reduced losses are experienced by bakers while the gains are experienced by consumers makes no difference based on the framework's ethical perspective.